Bismarck, ND – Laying your pets to rest is never easy. Pet cemeteries allow people to visit their furry family members years after they pass. But that may no longer be the case for those whose pets are buried at Billie’s Meadow. “This is where Bear is buried,” says Shannon Keller-Becker, pet owner. 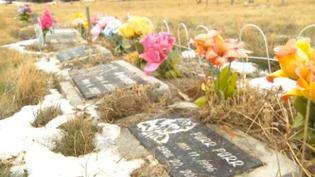 Shannon Keller-Becker visits her two cats Bear and Camry at Billie’s Meadow Pet Cemetery at least once a month. But soon, she won’t have that opportunity anymore. “Just devastating, heartbreaking,” says Keller-Becker. Billie’s Meadow will be closing. “You know, we all, over 300 pet owners were forced to grieve the first time around when we lost our pet or multiple pets and now we’re being forced to grieve a second time,” says Keller-Becker. The sign posted at the site says owners have until March 30th to collect their keepsakes…and if they so choose, their pets. “Basically being handed a shovel in the middle of a North Dakota winter and being given a 60 day deadline saying this is the last time that you can come out and grieve, come out and pay respects, come out and see your pet or you’re free to take it with you,” says Keller-Becker. And taking her pets with her is something she doesn’t think she could or would do. “The elements set in, time sets in, the moisture, the land, I’m not sure we can handle it emotionally to remove her,” says Keller-Becker. Terry Heck started the pet cemetery in the early 2000’s and has 4 of his own pets buried there. He says he was blind sided by the news of the closing. “This is just totally inhumane. I’m very upset because I gave my promise to the people that are there that my pets are also buried there and the pet cemetery permit is good for 99 years. I expect this person that bought it to respect the wishes of the people of North Dakota,” says Terry Heck, First owner of Pet Cemetery. And, Terry says he assumed that anyone who bought the land had to honor that permit. “If these were human bodies in here, no way would we even be having this conversation. You know, there’s got to be some type of laws and rules out there to protect these innocent animals,” says Keller-Becker. Landowner Jarod Obering was not available to do an interview with us but he says he wants to be as reasonable as possible and make this as easy as he can on those affected. He says he’s also extended the time frame for those who want to re-locate memorabilia. “Let our pets rest in peace. That’s where we chose them to be buried and just leave them alone,” says Keller-Becker. And is not okay with what’s happening. There will be a public meeting on January 26th from 7pm to 9pm at the Bismarck Veterans Memorial Public Library to decide what’s next for the pets. Landowner Jarod Obering says the time frame has been extended to better accommodate those who want to relocate memorabilia. He’s compiling an email list of individuals who wish to be notified when the frost is out. They can email “BilliesMeadow@gmail.com.” There will be an updated date at that time. via Pet Cemetery to Close | WDAZ.